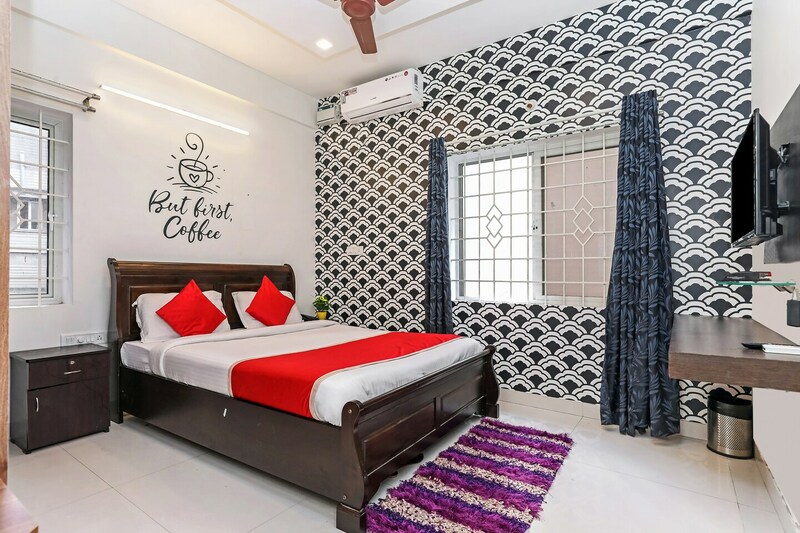 Hotel King Suites is popular among a number of travelers visiting Bengaluru and looking for comfortable accommodation facilities without feeling a pinch in the pocket. The hotel is situated near Baptist Hospital. The rooms have been designed very elegantly. The walls have not been painted and instead of beautiful wallpapers with intricate designs have been used. All rooms are well-furnished and a lot of woodwork is involved. Large windows have been provided in each room which is covered by long and thick curtains. The additional facilities provided by the hotel are free Wi-Fi, an uninterrupted power backup source, parking provisions, card payment in all forms, laundry provisions, CCTV cameras, and an elevator facility. The in-house facilities include a common dining area which can be used by the guests as and when required. The maintenance of the entire property is under a team of dedicated staff. The hotel is surrounded by a number of utilities like the Hebbal Bus Stop, Hebbal Railway Station Pizza Hut, The Punjabi Rasoi, Totally Hot Stuff, and BDA Complex.